Siemens was looking for a robust, functional and affordable case to safely house and autonomously power the train protection system MiniLEU S11. The MiniLEU S11 is used for the new train protection system and deployed by the Swiss Federal Railway company SBB AG throughout Switzerland. The system transmits the signal aspects by means of radio frequency to the vehicle with great energy efficiency and intervenes if the train driver makes a mistake. The initial requirement was for the construction of a simple painted plastic cover on which external solar cells could be mounted. On the strength of their first joint projects, which entailed modified 19" front panels and 19" subracks from the standard POLYRACK product portfolio, Siemens contacted POLYRACK for its new project, too. In this case POLYRACK's experience with customer specific solutions was particularly important. In the end POLYRACK was awarded the development contract to design a complete case in accordance with the requirements specification in the maximum dimensions of 300x300x300mm. Planning the development and implementation time before the project started, the packaging specialist calculated four to five months to design and construct the tooling. However, the tender for the project specified just a few weeks for tool making and design of the equipment. POLYRACK rose to the challenge and was able to meet the specified time line for tool making and for the presentation of the first manufactured parts to Siemens. In doing so the specialist ultimately beat its own time target thanks to its available tool making capacity. Not only was the cover was needed for the planned case, but also the construction of the base using glass fibre reinforced plastic - and threaded sleeves that were injected into the component. The transparent cover is also held by hinges that are already integrated into the die-cast component. These specific requirements constituted the decisive factor in the selection of the material. As the case was to be positioned directly next to the track bed, it was important to ensure that it could not be damaged by e.g. loose gravel; also it had to be resistant to all types of weather conditions and be able to withstand hailstorms and being bombarded with ice. In its discussions with the customer, POLYRACK recommended the use of a transparent material. This has correspondingly robust qualities, whereas Plexiglas (PMMA) would break with the first stone impact. The material also scores with its UV stabilisation, so it is much more suitable for use outdoors in any wind and weather. The design specifications from Siemens incorporated the current railway standards with which the case had to comply. After completion, POLYRACK tested the case to check that it met these high requirements. Siemens' task was to implement an autonomous train protection system for the track area. The system was to power itself using solar cells, storage batteries and emergency batteries, thus avoiding expensive cable installations. Here the installation of the solar cells on the case played a key role. In order to protect the cells from stones flying up due to passing trains, the original plan, which was to mount the solar cells externally on the cover, was rejected. Instead it was decided to install the cells within the case. However, this meant that the case needed to be fitted with a window. For while the cover had to be transparent, other areas of the case had to be non-transparent. The solution developed out of the joint consultation with POLYRACK. Siemens was satisfied with the possibility of making the basic element completely transparent and only partially painting certain areas. The case was given a coloured finishing coat for recognition factor as specified by Siemens and the customer logo was silk screened. To ensure even better protection against sunlight, POLYRACK also recommended the use of UV protective paint. 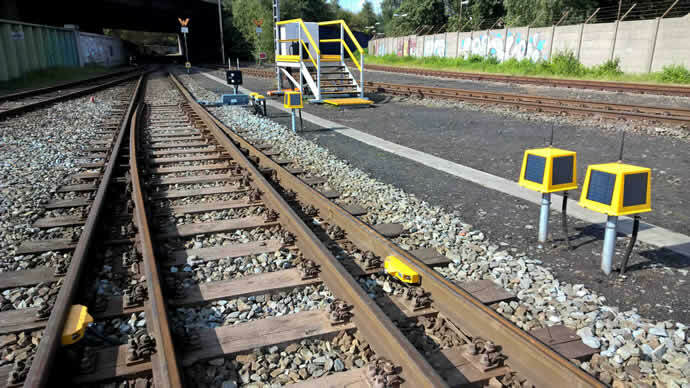 A matt finish was required to prevent the train driver from being dazzled along the railway track. The choice fell on a matt finish that protects the equipment from strong UV radiation and facilitates long term deployment. In the end, the packaging firm produced the hood, partially painted and printed it and handled the pre-assembly. It mounted all of the internal parts that were needed for installation of the solar cells, including a suitable chassis plate. Installation of the solar cells themselves was performed by Siemens in Switzerland. Despite the shortened development and construction time, POLYRACK completed the required parts for Siemens on time. 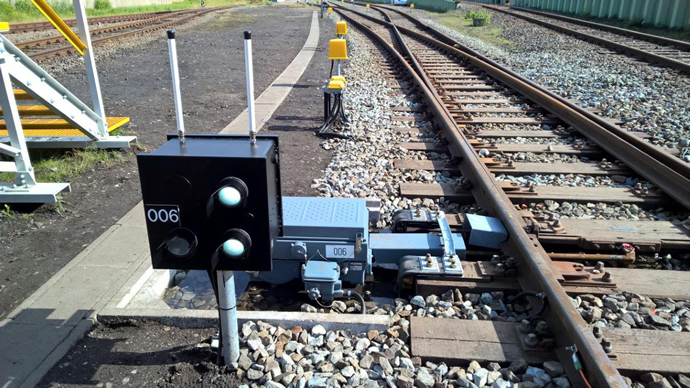 In the meantime there are around 2,500 series produced devices performing their train protection function on the tracks of the Swiss Railways. Siemens now lists the end product, which bears the name Train Guard ¬Mini LEU S11 (Line Equipment Unit), in its standard programme. In future it will be used anywhere in the world where it meets the applicable requirements. The all-purpose case has convinced Siemens in Germany to use it for further railway projects in Braunschweig. Here for example, an assembled version of the Swiss product, which has been adapted by POLYRACK to meet the new requirements, is used. It was painted yellow, supplemented with project specific assembly components and is used under the name of Clearguard WWS111 as an axle counting system for decentralised electric points. The collaboration between the customer and the manufacturer during the entire planning and construction phase was essential. Staff from the Mobility Sector of Siemens was closely involved with the project. “POLYRACK convinced us with the case implementation for two railway projects. We have acquired a case that exactly meets our specifications and which POLYRACK adapted even more precisely to our needs and requirements. This was only possible thanks to the close collaboration that we had,” said a spokesman.